Parrots are highly intelligent and highly sensitive birds. One of the most common behaviors that parrots use to show illness or stress is feather plucking. Chronic feather plucking may be hard to diagnose, and even harder to treat. Proactive changes on the part of owners may help to prevent the start of plucking behavior. And understanding the most common causes of plucking may help to quickly stop this behavior in your beloved parrot. Parrots generally molt twice a year. During the molting phase, they will lose their feathers as new feathers grow in. This process differs greatly from intentional plucking. When parrots pluck their own feathers, bare skin will be visible. During molting, parrots will not have bald spots of skin visible. If you see bare skin on your parrot, your bird is very likely plucking his or her feathers. 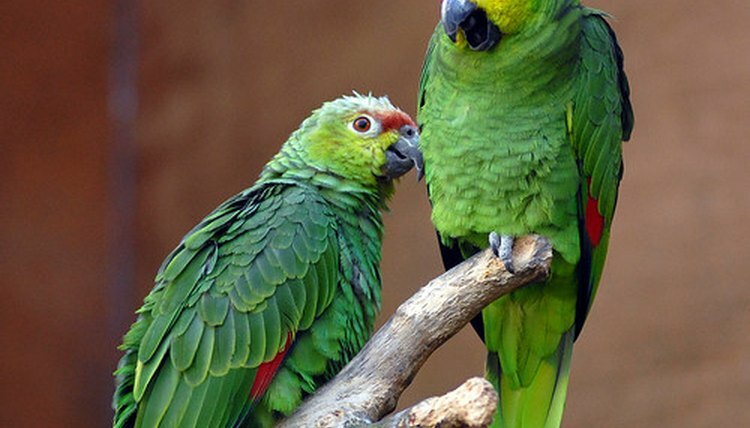 According to veterinarian Ron Hines, malnutrition is the leading cause of feather plucking in parrots. Birds that are fed primarily seeds will not receive the proper nutrition. The skin becomes dry, and molting phases become irregular. As a result, the parrot may begin to overgroom. Eventually, this grooming may become a behavioral habit, and plucking may continue even after a more balanced diet is introduced. The second most common reason that parrots pluck their feathers is stress. Parrots can become stressed because of lack of attention from their owners, dirty or cramped accommodations, and boredom. According to veterinarian Ron Hines, "Some birds literally groom their feathers off for lack of other pastimes." General conflict or stress in the household can also cause stress among more sensitive parrots. Medical conditions can sometimes cause parrots to pluck their feathers. One of the most visible symptoms of internal illnesses is feather plucking. Occasionally, lice or mites can cause parrots to pluck their feathers. Any parrot that plucks his or her feathers should receive a thorough examination by an avian veterinarian. If the plucking is behavioral, environmental changes and anti-anxiety medication may be needed. If nutrition is determined to be the cause, the parrot's diet must be improved. Finally, any underlying medical causes should be treated under close supervision of a veterinarian.